Our Texas A&M Geoservices geocoder takes postal addresses you submit and provides you with approximate latitude and longitude output data for those addresses. You may notice that sometimes certain output coordinates are more accurate than others, and the quality of the returned output data can be attributed to our weighting system for geocoding accuracy. 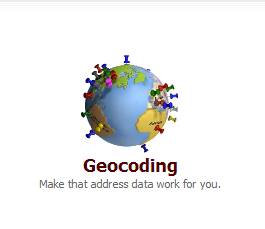 Texas A&M Geoservices utilizes reference databases including a Boundary Solutions Parcel File (2012) and TIGER Files (2010) in order to geocode your data. Our parcel data contains information at the building level, sometimes referred to as rooftop resolution. This is the data everyone would love to have. Currently we have approximately 30% coverage of the US in this format. Unfortunately, this data is very expensive and would raise the cost of our service significantly to purchase more coverage. We continually strive to update our data in house in an effort to bring you better results while maintaining our low prices. Tigerfiles are publically available data from the US Census Bureau. If your address is not contained in our parcel data we implement a range of interpretive algorithms created by Dr. Daniel Goldberg to arrive at the closest approximation based on data contained in the Tiger data files. These algorithms utilize a dynamic weighting technique to approximate the most accurate match to the given address. This can range from a street level interpolation to zipcode, city, or state centroid. Street level interpolation is the method of matching to a street and specific block within that street and then calculating the most likely location on the street based on the range of numbers for that block. Centroid methods are just as the name implies, when a street segment is not found the resulting data will be matched to the nearest point such as the center of a zipcode, city or state depending on the data available. Our geocoder will give you back a quality match type for your data as outlined below.